Although tigers are the biggest of all cats, they can be one of the hardest to find. Tigers live deep in the jungle, often residing in shadows and long grasses where their stripes provide camouflage. Each tiger has a unique pattern of stripes. Most tigers are orange with black stripes. Others, like white tigers, survive in the wild because their white fur does not provide much camouflage. Tigers hunt by night, which makes it easier to attack. They often travel many miles in a night in search of prey. 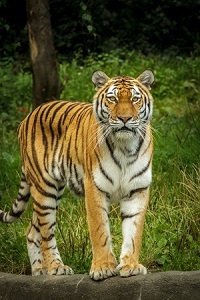 Tigers normally hunt for deer, wild pigs, cattle, monkeys, and reptiles. They can even kill young elephants or rhinoceroses. Tigers like to swim. During hot weather, they may take a dip in lakes and rivers to cool down. They are great swimmers and are able to make their way across large rivers if needed. Usually tigers don't eat humans unless they are too sick or old to find other prey. Between 1956 and 1983, tigers killed more than 1,500 people in one area. Humans sometimes wear masks when they enter the forest to confuse and scare the tigers for protection. Tigers are amazing creatures. While some humans may be afraid of them, tigers are unique and powerful animals.